MONDAY, FEBRUARY 11—The ACT Governing Board met on February 9 to vote on amendments to the group's bylaws, the first such changes since 2016. You may see the amended Bylaws here. Besides the proposals announced in advance, there was an additional amendment that had to be considered. 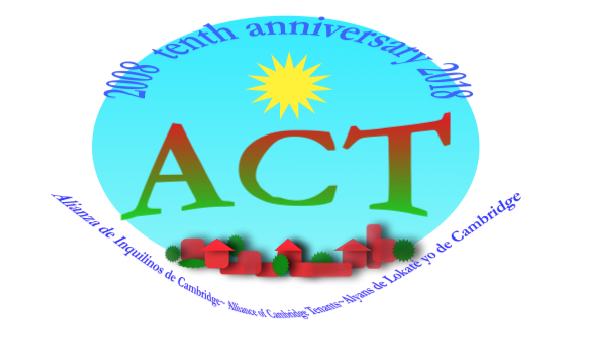 SATURDAY, JANUARY 26 [update]—Notice is hereby given that the Governing Board of the Alliance of Cambridge Tenants (ACT) will meet on Saturday, February 9, 2019 at 3:00 PM at 135 Prospect Street. This meeting will vote on amendments to the Bylaws including Articles IV, V, VI, VII, IX and XV. TUESDAY, JANUARY 15—We’ve received a bulletin from Vicky Negus and Pat Baker of Mass. Law Reform (MLRI) about what’s happening with SNAP (formerly the “food stamp” program). MLRI has also produced a flier about this in English and Spanish. THURSDAY, JANUARY 3—When the Federal government went into shut-down mode last month, a lot of voucher tenants wondered what would happen to them if their landlords didn’t receive the subsidy part of their rents in January. It turned out that the subsidies were paid on time even though 95 percent of HUD employees were home on furlough. THURSDAY, OCTOBER 11—The Housing Authority (CHA) does not like to evict tenants. But if you violate your lease—by not paying the rent, for example—your manager will send you a notice asking you to come to her office. If there is a serious lease violation you may be asked to sign a document called Agreement for Judgment. Up until this month tenants signed agreements like this right in the manager’s office. MONDAY, AUGUST 6, 2018— Although ACT does not hold City Wide or Board meetings during July and August the Officers and other members continue to work. 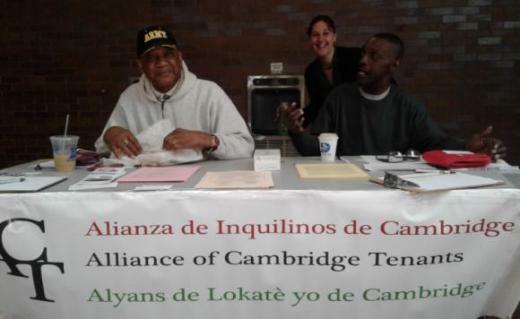 In April and May ACT participated in the Affordable Housing Week of Action which was coordinated by the Community Development Department of the City of Cambridge. The Week of Action is an annual initiative of the National Low Income Housing Coalition (NLIHC). ACT is a member of NLIHC.